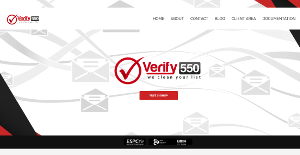 Verify550 is a comprehensive, user-friendly email list validation and verification solution that helps business organizations and enterprises clean their email lists, filter out bot email accounts, traps, litigators, informants, seeds, and sleeper cells with its proprietary email hygiene technology. This application greatly reduces bounce rates as well remove all threats in your inbox, which can be costly and time-intensive when done manually. With Verify550, your email lists are pristine, safe, and secure. Users never have to deal with cleaning their lists on their own, which meant having to work with servers, domains, and IPs. A cleaner, more secure email list means you can mail without worrying about any repercussion as well as more possibilities to generate more money. Verify550 makes it quick and easy for you to clean your email lists and make your inbox free from bots, litigators, protestors, roles, and more. It threshes your email lists thoroughly and removes traps, sleeper cells, monitoring emails, litigator traps, faultfinders, objectors, grumblers, bounces, and more. With its proprietary email hygienic technology, Verify550 delivers clean, pristine email lists that contain validated and verified emails, so you can email away with no worries of bounces, undelivered messages, and more. Verify550 cleans out your lists of all threats, bounces, bots, and traps in one go with its powerful email hygienic technology. Otherwise, you’ll be spending months removing protestors, litigators, and informants from your email lists. You certainly don’t want to be spending that much time stripping your email lists, do you? Taking out the trash from your inbox is also expensive if you decide to do things on your own. You will need lots of servers to get the job done and by the time you are through scrubbing the threats off your lists, your expenses will definitely be astronomical. With Verify550, all you have to do is upload your list and let the system work its magic, saving you huge amounts of money in the process. What Problems Will Verify550 Solve? 1.) Verify550.com ensures your ESP account does not get suspended by reducing your bounce rate, trimming down complaints and removing informant traps. In some instances, when a marketer uploads a list into an ESP, they have detectors that flag certain emails and the ESP will not let them use the list. Verify550 gets you through those issues by cleaning your lists thoroughly. 2.) Email marketers are constantly monitored. Spam informants sow seeds through bots and operators to fill out forms that links a domain to a campaign. If a domain doesn’t match the seed, the emailer gets blacklisted. Verify550.com tracks spam informants in real time and updates its suppression which now takes out sleeper cells, emails that are hosted on spam informant servers. 3.) There are almost 12,000 internet service providers worldwide. Not one of them use the similar practices in filtering out spam. Many use spam informant static lists of IPs and domains while others block keywords. Static lists and keywords do not work anymore thus most intelligent informants and ISP’s monitor email addresses by planting bots and seeds. Verify550.com removes the eye in the sky allowing you to email to real people and not spies. Every company has different requirements and needs a software that can be personalized for their size, kind of staff members and buyers, and the specific industry they are in. For these reasons, no system can offer perfect tools out-of-the-box. When you try to find a software app, first be sure what you need it for. Read some Verify550 reviews and ask yourself do you desire basic features or do you need complex tools? Are there any industry-specific features that you are seeking? Find the answers to these questions to help your search. There are lots of factors that you need to reflect on and these include your finances, specific business wants, your organization size, integration requirements etc. Take your time, use a few free trials, and finally select the system that offers all that you need to boost your company competence and productivity. How Much Does Verify550 Cost? Contact Verify550 for enterprise pricing information and other product details. You can also sign up for free to see if the software is a perfect fit for your business. We realize that when you make a decision to buy Email Management Software it’s important not only to see how experts evaluate it in their reviews, but also to find out if the real people and companies that buy it are actually satisfied with the product. That’s why we’ve created our behavior-based Customer Satisfaction Algorithm™ that gathers customer reviews, comments and Verify550 reviews across a wide range of social media sites. The data is then presented in an easy to digest form showing how many people had positive and negative experience with Verify550. With that information at hand you should be equipped to make an informed buying decision that you won’t regret. What are Verify550 pricing details? What integrations are available for Verify550? If you need more information about Verify550 or you simply have a question let us know what you need and we’ll forward your request directly to the vendor.